Here’s the second of our four semi-final contestants in our 2014 March Madness contest — Legolas, member of the Fellowship of the Ring. In this piece, Tolkien scholar Michael Martinez discusses the paradox of Legolas — “both old and young, both wise and yet inexplicably ignorant of the wide world around him”. Don’t forget to click the link at the bottom to continue to the full essay. I decided to set myself a challenge and write something about Legolas which hasn’t been said before. There seems to be a lot of curiosity about this Elf. People want to know all sorts of things about him, such as what color was his hair, who was his mother, when was he born, was he at the Battle of Five Armies? If someone were to produce a television series based on the Fellowship of the Ring (the company, not the book), they would have to come up with their own history for Legolas. 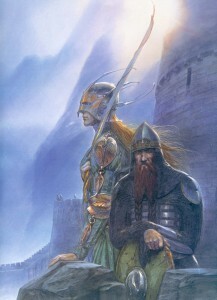 The inevitable exploration of each character’s background would result in episodes where Gandalf first learns that Middle-earth is dangerous even for Maiar (say, within a year after he steps off the boat); where Aragorn tracks down his first Orc; where Gimli learns to cope with being the son of Gloin; where Frodo remembers the day his parents drowned; where Pippin watches as his sister Pearl takes Lalia the Fat for her last ray of sunshine; where Merry goes into the Old Forest for the first time; where Sam capers about with Rosie Cotton and her brothers, and he first realizes he loves her; and where Boromir tries to come to terms with the fact that he’ll never be King of Gondor. Legolas’ moment of doubt before the Balrog was a defining event. He panicked. He recognized the Balrog for what it was and lost heart. “Ai! 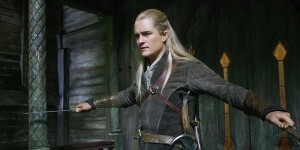 Ai!” wailed Legolas. “A Balrog1 A Balrog is come!” He dropped his arrow to the ground, rather than shoot the thing. Nonetheless, the encounter may have better prepared him for confronting the flying Nazgul over Anduin. Legolas had leaped up the bank and drawn an arrow, seeking a target. “Elbereth Gilthoniel!” he cried when he sensed the approach of the flying Nazgul. He was startled and moved by fear, but now he had greater courage.